The bedrock of his system is simple: work hard, pay what you owe and stay out of debt. His main commandment is "Pay cash." He first exhorts the reader to take "baby steps," which are designed to build on each other: first, save $1,000 as an emergency fund; then, pay off all debts from smallest to largest; save a larger three-to-six-month emergency fund; finally, start to save for college and pay off your home mortgage. Ramsey understands the difficulty in putting these steps into action, and therefore packs his book with personal testimonials from everyday people who have used his system and have become debt free, with obvious struggles. Mr. Ramsey refers frequently to his financial failures and his use of this system to get him back on track. He also discusses that debt is a relatively new phenomenon and is largely the result of marketing of retailers and the marketing of lenders. It's a two-pronged front on your financial sanity. You're sold on the fact that you need more “stuff” and the lenders sell you on the importance of leveraging, loans, and using credit. His points are both interesting and convincing. As someone with a little debt to get rid of, I'm sold on Mr. Ramsey's model. I'm implementing it now and I've just begun reading his earlier book, Financial Peace, to see what else he has to teach. A good reference to getting rid of debt. This book is filled with easy-to-follow, easy-to-understand steps, and details the reasoning behind each step. Each chapter is interspersed with true accounts of users of this book. A good book for simple steps to debt management. Dave Ramsey’s The Total Money Makeover should be the first book on the reading list of anyone who is struggling with debt or, as the author says, is “sick and tired of being sick and tired.” In straightforward, simple, and rather blunt terms Ramsey walks his readers through the seven baby steps that will lead them out of debt and into financial peace. Many people hesitate to take the advice of financial experts because it is difficult to know if their advice works. Ramsey’s advice, however, has been field tested. Dave Ramsey has seen both the highs and lows of financial life. By the age of 26 he had created a rental real estate portfolio worth more than $4 million. His entire net worth had been built on debt, however, and when the banks came calling he was forced into bankruptcy. Since then, Ramsey has eschewed debt and has rebuilt his fortune many times over. I am not going to go over every single step in the book. Instead, I will discuss the main themes of the book. Ramsey is an ardent believer in personal responsibility. Consider him the AA of personal finance. Until you are able to admit that your debt is the result of your actions and that only you can get yourself out of it, nothing else will work. The key, in Ramsey’s opinion, is the written budget. Everything he teaches begins there. You must know exactly where every dollar you make is going, before you even earn it. If you don’t plan this out, you will never be able to take control of your finances and take control of your life. 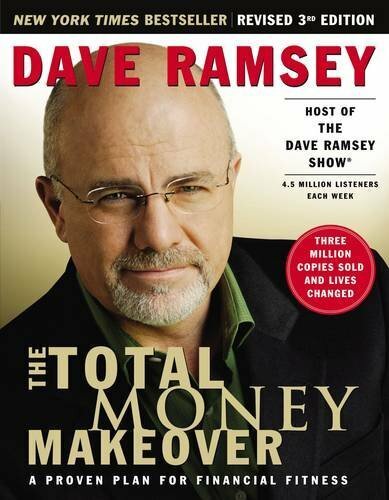 Dave Ramsey is the guru of money makeovers. Common sense material. A very nice read. The book makes a great gift for family and friends. Helpful, highly motivating book. Other books have sound advice to get ones finances in order. This book really gets you to get going and get the hard work done. Unreal. This has changed our perspective on saving and getting out of debt. We are now determined to be debt free. Fantastic! Here is a book that provides you with a life plan that is easy to understand AND implement. You are required to follow a plan that gets you out of debt, build an emergency fund, plan for the future, and build wealth. This is not a get rich quick scheme, but a build wealth scheme over time. For those will to follow Dave's principles, you are encourage to cut up and close you credit cards, live on cash. Debit cards are fine to use as well. For many, this will seem foreign or impossible. For those that take the journey, you will be rewarded. I bought this book used at the advice of a well-meaning family member. I can only hope the "update and revised" editions are better. To be completely honest, I began to skim the text after the author displayed a fairly fundamental misunderstanding of the banking system and used "intellectual" and "academic" as insults. The "folksy" tone and constant use of Bible verses was also off-putting. This book has very little to offer anyone who is using their credit responsibly and are not already drowning in debt. The behavioral changes he recommends are likely very helpful for those who have irresponsibly over extended themselves already. A large portion of his advice seems like good advice; however, it doesn't really extend beyond common sense. Perhaps my biggest complaint is simply a nit pick. The author translates the "college experience" into "they want to party" when discussing why there is no reason to not work during college. Since the author uses "intellectual" as an insult, I guess I shouldn't expect him to understand the many intellectual benefits of not having to work during college. I worked during my 3rd and 4th years; however, I worked far fewer hours than he seems to be suggesting. Not working during college gives one the ability to go to interesting lectures and seminars taking place in other departments, grapple with difficult material, read books and articles outside the required material, and attend art and cultural events. Obviously, not working (or working only a few hours) is not an option for everyone, but there are benefits to the "college experience" that were well worth taking on a bit of debt for. To claim that the "college experience" only consists of "partying" seems to underscore the author's singular focus on a portion of the population with severely misaligned priorities. Excellent book to help someone get control of debt and finances. This book was great. I read it in one day. I can't wait to complete the activities and start off the new year on the right foot. Motivating and Inspiring! The best book on the market when it comes to getting your financial house in order. Another good book. A bit different from Financial Peace - enough was different but there were parts where I thought yep, I just read that in the other book LOL! Oh well, repitition is a good thing and reading the real people's letters was very helpful as well! Good ideas. I just don't care for the attitude. I also could do without the reiteration of a point over and over. Make your point and move on. Let's get down to the nitty gritty of this thing.